AREA Fund provided a grant to the UBC for a Mesothelioma Awareness and Compensation project. AREA Fund also assisted in finding participants for the study. The interview phase of the project is complete; they are currently summarizing the findings. AREA Fund provided a grant to the UBC Centre for Health Services and Policy Research (CHSPR) for a Mesothelioma Awareness and Compensation project. AREA Fund also assisted CHSPR in finding participants for the study. Research shows that less than 50% of mesothelioma victims and their families apply for compensation for this devastating terminal disease, even though it is estimated that well over 80% of mesothelioma victims fall ill due to workplace exposure. The aims of the project were to determine why mesothelioma patients do or do not seek workers’ compensation, to understand the role of the physician as a key player in the compensation process, and to consider opportunities to improve information on awareness, eligibility, and application for compensation. A trained interviewer interviewed 26 individuals with mesothelioma, or their family members, and interviewed a separate sample of 24 physicians drawn from directories of physicians who would typically see patients with occupational disease. Individuals with mesothelioma and their families rely heavily on physicians as trusted sources of information for both medical and compensation-related issues; the process for filing a compensation claim is perceived as complicated/bureaucratic. The physician can be key in initiating the compensation process; individuals and their family members had a beneficial experience once they were in contact with the compensation system. 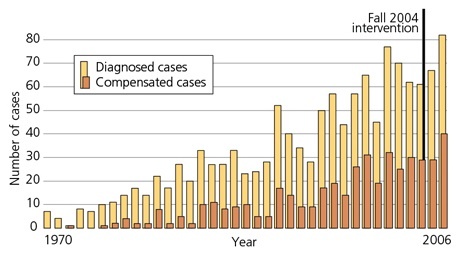 Physicians are aware of asbestos and mesothelioma as an occupational exposure and a compensable disease and they tend to agree with statements that they are unfamiliar with the workers’ compensation system, that helping individuals with mesothelioma seek compensation is time consuming, and that the compensation process is a barrier for their patients. The findings indicate the need to increase awareness of the importance of the physicians’ role in recognizing occupational exposures and related diseases, and in facilitating contact with the workers’ compensation. In response, the investigators met with the UBC’s Faculty of Medicine eHealth Office to explore, for future work, how modern communication technologies can be used to increase awareness among physicians and facilitate processes to put individuals and family members in contact with the workers’ compensation system.